Wow! I'm so excited about today's post. 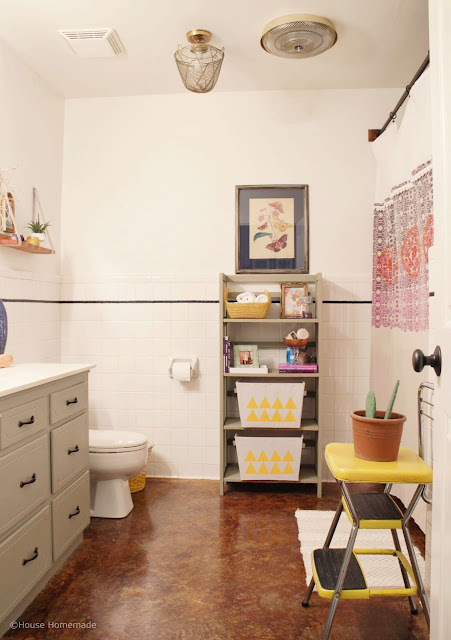 I'm going to show you how to make the CRAZY easy shelf I slapped together for our girls/ guest bathroom makeover. I had all the supplies already but even if you have to go out an buy every piece, it couldn't be more than $10. Promise*. *I don't actually promise because I have no idea. But I do promise it's a cheap project. 2 mollies (those plastic thingys that go into the wall and help you hang heavy stuff when you can't screw into a stud.) My motto is, when in doubt, use a molly. 2 strips of thick scrap fabric. Mine was mattress ticking. It's a very thick weight. 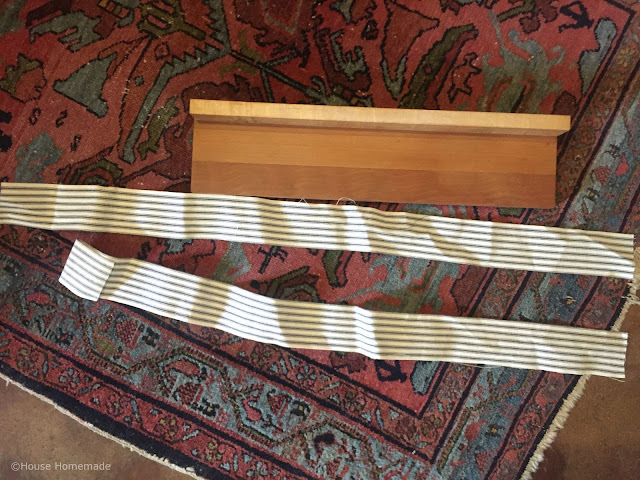 The strips of fabric I used are 38" long by 2.5" wide. I used the iron to make the strips smooth but I also folded each side under and ironed it so that no raw edges were showing. The finished width was just under an inch thick. 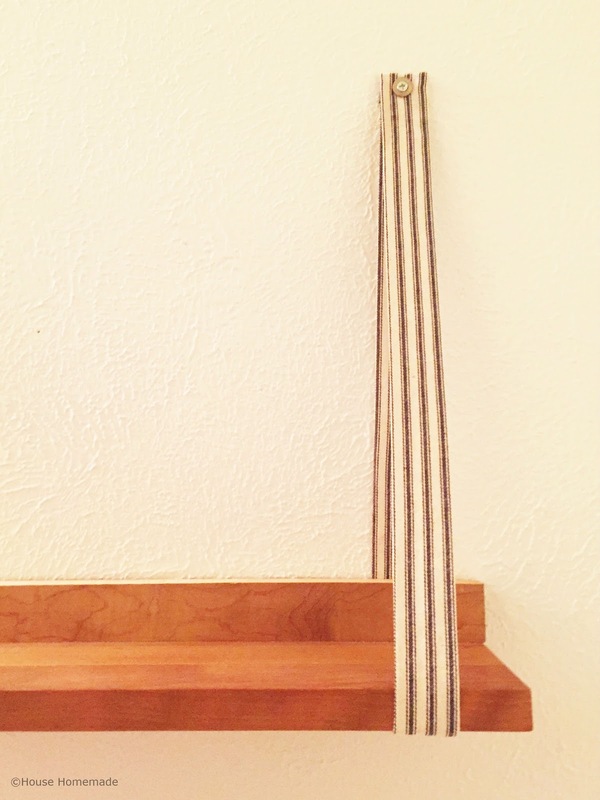 Once I had my strips ready and before I turned the iron off, I folded each end over to create clean edges there too. I pressed them down for a hem like edge. "Hem like" because I didn't sew a thing. 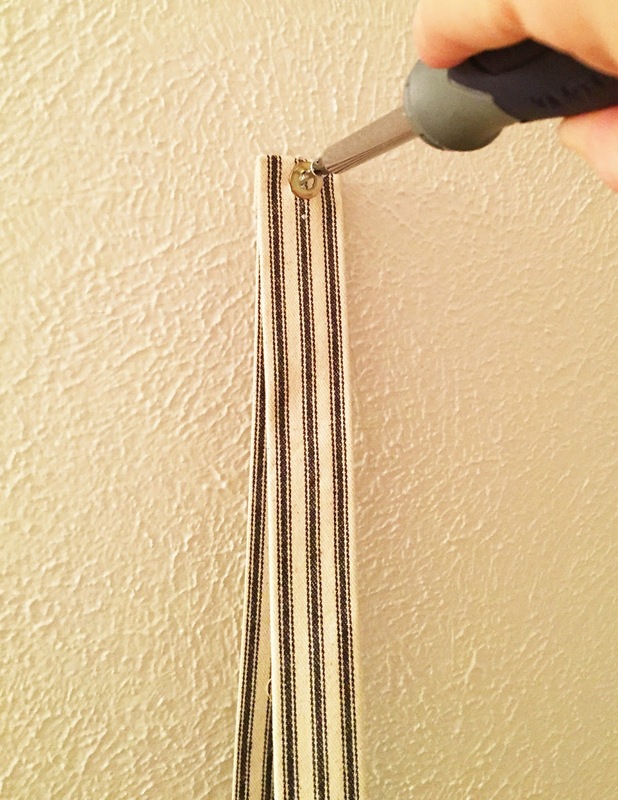 I did this for the nice edge but also I felt like it was a good idea to make the screws go through as much fabric as possible, creating a stronger shelf. If you use a thinner material, this is important. 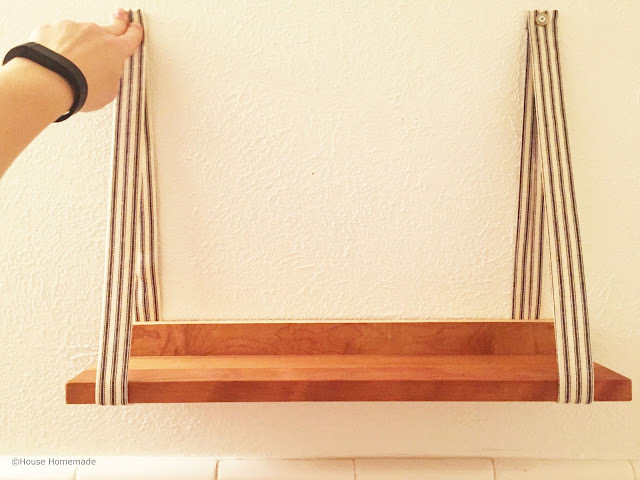 I was thinking you could even use a thick ribbon as your shelf hangers but just make sure you are overlapping as many layers as possible for the stronger hold. I started mounting it by first deciding where I wanted the shelf and installing one side first. I hammered my screw driver into the wall to make a hole for the molly. Once the molly was in the wall, I put the washer down over my fabric and turned the screw through the fabric by hand (holding tight to all the piece of fabric so that nothing shifted). Once the screw was visible on the other side, I put it up against the wall and finished screwing it in. I used the washer, just for a bit more interest. I thought the screw alone might not look as clean and finished as with the added metal around it. You can see the fabric folded over at the top in the photo above. Added stability. I'm talking stability for candles and a frame, not chin ups. 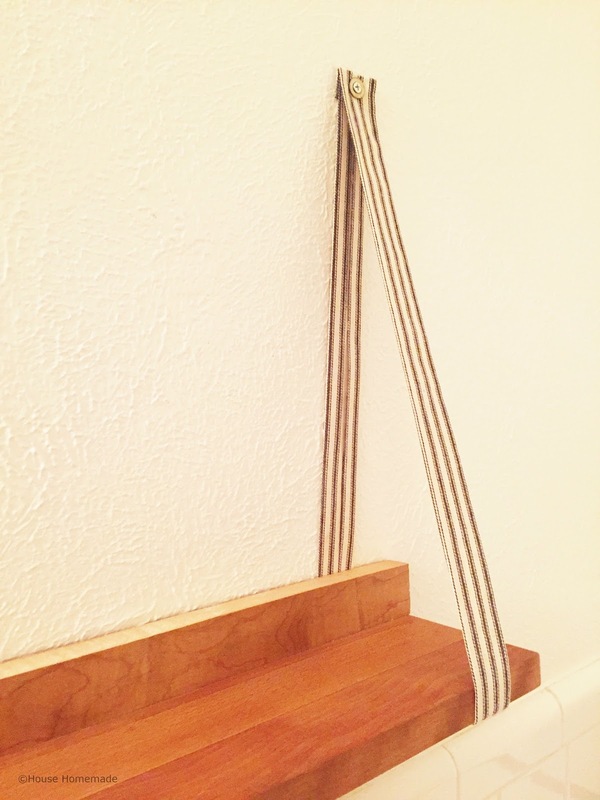 I looped the other piece of fabric through the left side of the shelf and used the level to make sure everything was even. You don't have to worry about the shelf being centered because it never gets attached. It can be shifted any time. Install the molly and hand twist the screw and get that puppy onto the wall. SO EASY. I feel like that was lots of supplies and steps but it really was up on the wall so quickly. AND it was so simple that I did it by myself and even had a hand to take these pictures. So there ya go. 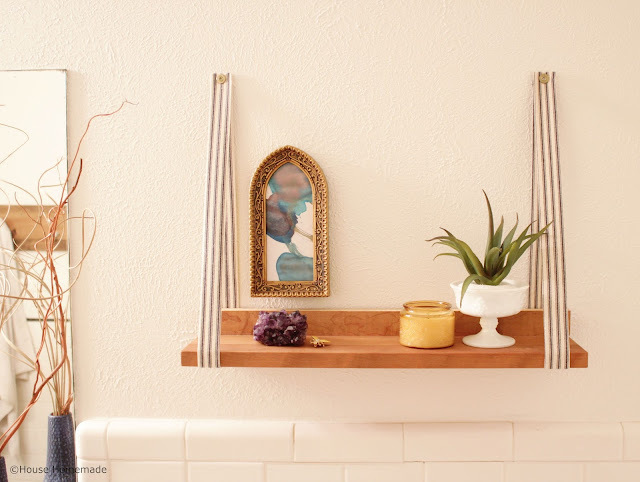 Now I want a shelf like this in every room. I love it so much. I kept it clean and simple with a candle, a fake succulent from Hobby Lobby (because I cant keep real ones alive) and a couple things from around the house. The frame was something that Nickerbean 1 picked out at my hubby's grandmother's house. I put water color art in it and mounted it above the shelf for some height. It's strong enough to hold lots more but I didn't want to fill a shelf above a toilet with unnecessary things. Poor shelf got the most unfancy display space--above a toilet. At least the bathroom is pretty. Anyway, that's it! Mommas, this is a nap time project. Heck, might even be a snack time project. So quick. If you make one, make sure to show me. Also, if I left anything out feel free to ask!